"Once there was a bright young man who was looking for an effective designer. He wasn't looking for just any designer. He wanted to find a designer who could design complex technology that was simple to use." 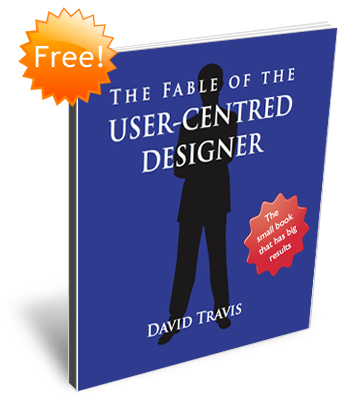 Follow a young man's journey as he discovers the three secrets of user-centred design. It's a small book that has big results. “This Fable has proved to be a wonderful way to evangelise User Centered Design in LEGIS. We've read it, discussed it and worked with it. Everybody loves it.” — Moisés Brainsky, LEGIS. Download epub version — best for iPad, iPhone and other eBook readers. Download "The Fable of the User-Centered Designer" in another language. Simplified Chinese (pdf) (thanks to Wen Nivala). Traditional Chinese (pdf) (thanks to Wen Nivala). Dutch (pdf) (thanks to Sven-Eric Buschgens of Resultaatgenieters.nl and Qurie de Berk). French (pdf), French (epub), French (mobi) (thanks to Fr'd'ric Vandaele). Hungarian (pdf) (thanks to Kolozsi Istv'n). Indonesian (pdf) (thanks to Agung Kurnia Robbi). Spanish (pdf) (thanks to Moisés Brainsky). Turkish (pdf) (thanks to Turgay Baş).